While several members admitted that “no plan is perfect,” the Loudoun County School Board unanimously voted Tuesday night to advance an attendance zone plan to prepare for the fall 2020 opening of Lightridge High School in Aldie. The new high school is part of an effort to address the high level of population growth in the Dulles South area of Loudoun County. As a result, school administrators are forced to make tough decisions with hard consequences that could, in theory, result in some students attending five different schools over five years, as the county tries to keep up with enrollment growth. Lightridge High School is under construction on Collaboration Drive, near Braddock Road and Northstar Boulevard. It will serve up to 1,800 students. The opening for the start of the 2020-2021 academic year will also impact Willard Intermediate School in Aldie, which will be renamed Willard Middle School, serving sixth, seventh and eighth graders. Willard has been serving eighth and ninth graders since opening in 2018. 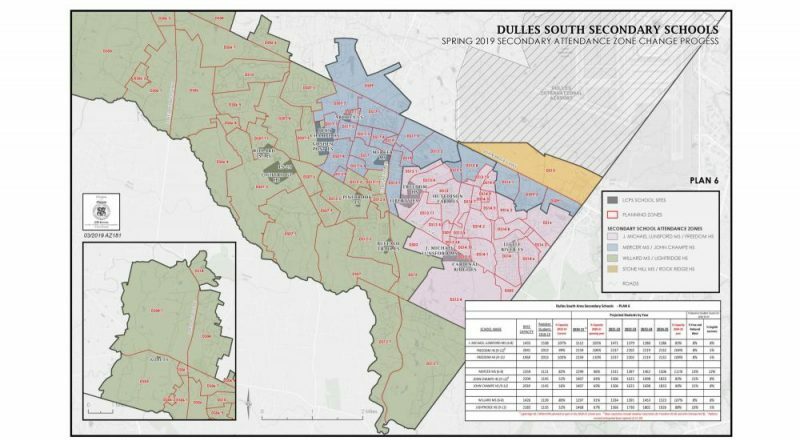 Other schools impacted by the boundary changes are J. Michael Lunsford Middle School, Mercer Middle School, Willard Intermediate School, Freedom High School, and John Champe High School. The board held public hearings and worked with members of the community impacted by the attendance zone changes, revising plans and digging into the details to come up with a final version known as Plan 6. Chairman Jeff Morse (Dulles) noted how unusual it was for all members of the board to consolidate on a single plan. He explained that administrators are trying to keep class sizes in check not just the first year after Lightridge opens, but 4-5 years out. “That is the goal, to even out the burden on all the schools … and balance the needs of all the children,” Morse said. Plan 6 “does a good amount of work to keep communities together,” added Board Member Beth Huck (At Large). She said the board considered many proposals and looked at ways to accommodate requests to stay at certain schools to come up with the best possible compromise while considering the needs of students and teachers. How will the board avoid the five-schools-in-five-years problem possibility? “When we open Lightridge, it will open without a senior class,” Morse said. The school system will work with parents and students at the junior level as well if there is a desire to stay at a certain school.